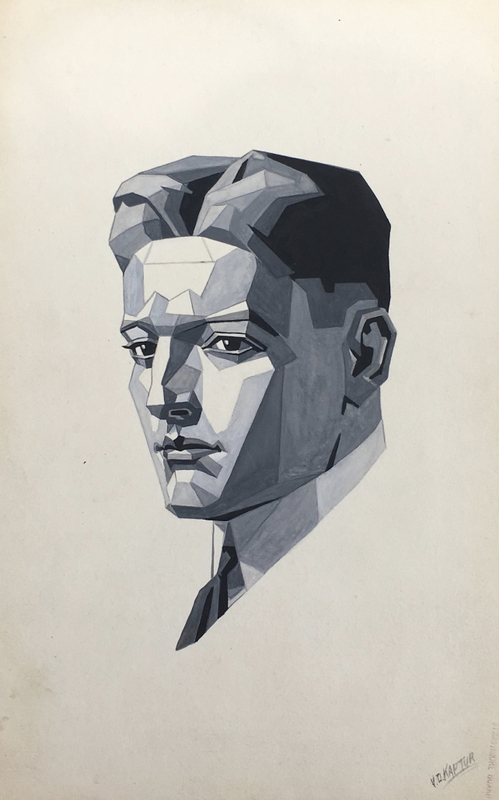 Self-Portrait of the Automotive Designer, Vincent D. Kaptur, 1923. Vincent D. Kaptur (1895-1987) was chief body engineer and designer for Packard automobiles from 1916-1928. Recognized as an exceptional talented, he was hired away from the company by General Motors, to help organize the company’s body engineering and layout. By 1930, Kaptur was appointed chief of his department. GM had produced a Buick in 1929 that was a catastrophic commercial failure. It had a design feature called a « rolled belt line », a widening of the body just below the window openings. Walter P. Chrysler, upon viewing an early production model, declared that the car was « pregnant ». The Detroit press picked up the moniker, and as a result of adverse publicity, Buick sales tanked. The loss of income was rectified by Kaptur, whose job was to compare body designs for the different products in GL’s lineup. Kaptur noticed that the completely disparate car models made by separate divisions were in fact similar in measurement, despite being made « in house ». Kaptur suggested that the divisions limit their models to three or four standard body sizes, which would permit commonality of parts, yet be flexible enough to permit stylistic differentiations. Kaptur called his idea the « A, B, C, D program ». Each letter represented a different chassis « floor plan » on which the models would be based. As with Henry Ford’s invention of the assembly line, Kaptur’s brilliant suggestion, first implemented by GM, soon became common practice for the entire industry, modifying for all time the method by which automotive producers develop their lineups. As one might expect, the handsome, 28-year-old Kaptur’s self-portrait displays accomplished drafting skills and razor-sharp precision. In the cubist idiom of the early 1920s, the designer geometrically parses his face into anatomical zones with exactitude, and separates them by distinct tonalities. His idealized, Modernist rendition, while synthetic, is not far removed from the archetypal « Arrow Collar Man » popularized in the Saturday Evening Post by Joseph Christian Leyendecker.